On May 26, the media’s attention turned to the southern Russian territory of Stavropol. 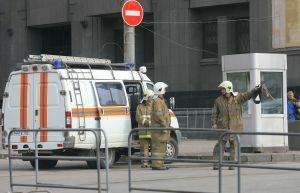 As the result of an explosion in the capital city of Stavropol, six people died and 46 were injured. The situation was exacerbated by two facts. First of all, since January, Stavropol Territory has been the base of operations for the Kremlin’s special envoy to the North Caucasus Federal District. Pyatigorsk, the capital of the new district is located here, and Special Envoy Alexander Khloponin has set up his temporary headquarters in neighboring Yessentuki. Secondly, the explosion occurred the same day that a Chechen dance ensemble, Vainakh, was scheduled to perform a concert at the Stavropol Palace of Culture and Sports. Whoever masterminded this terrorist act must have realized that it would affect the polyethnic society there. This latest challenge to the Russian authorities in forces an examination of the situation there, especially since officials in Moscow view the territory as the outpost of the Russian state system throughout the North Caucasus. The geographical and geopolitical position of the Stavropol Territory signal that this region demands particular attention. It is located in the center of the North Caucasus and shares borders with eight subjects of the Southern Federal District, six of which are semi-autonomous republics. For Russians living in national republics, Stavropol Territory has been a center of gravity. Throughout the 1990’s representatives of ethnic groups throughout the region requested to be merged into the Stavropol Territory. These groups included the Mozdok region of North Ossetia, the Kizlyar and Tarumov regions of Dagestan, the Zelenchuk region of Karachaevo-Cherkessia, and the Naur and Shelkov regions of Chechnya. In the 1990’s, leaders of the Russian and Circassian movement in Karachaevo-Cherkessia repeatedly promoted the idea of unification with the Stavropol Territory. After the Khasavyurt Peace of 1996, which concluded the first phase of the conflict in Chechnya, Stavropol Territory managed almost single-handedly—without support from Moscow—to maintain peace in the central part of the North Caucasus and to establish bilateral relations with Chechnya and Dagestan. Nevertheless, Stavropol cannot survive and develop by relying on its own forces alone. In fact, this subject of the Russian Federation requires far more federal assistance than other Russian regions. And this federal “intervention” cannot be limited solely to support for the territory’s prime vacation spot, Mineralnye Vodi. Stavropol has traditionally been considered a polyethnic region. In addition to Russians, the region’s residential population is made up of significant numbers of Armenians, Ukrainians, Darghins and Greeks. Although the numbers of Chechens, Nogais and Turkmens are smaller, these communities have played a significant role in the ethno-political development of Stavropol. Alongside cultural riches and variety, this creates not a few ethnic problems and latent conflicts that constantly require systemic attention. In the post-Soviet years, the Armenian Diaspora has had the highest rate of migration and the increase in their numbers as well as the rise of prominent members of the group in Stavropol’s political circles has led to simmering tensions. From time to time in Georgievsk, Stavropol and Pyatigorsk, clashes have occurred and nationalist leaflets have been distributed. In Yessentuki, arguments between Russians and Greeks are not infrequent (there are many Greeks there — emigrants from the Tsalkin region of Georgia). The Turkmens in Stavropol are the largest Turkish Diaspora in Russia. The difference of religion between Turkmens and Russians have caused some conflict between the groups and the situation has been exacerbated by the influence of Dagestani Wahhabis on the Turkmens. In January 1999, the village of Kendzhe-Kulak saw clashes between Russians and Turkmens. In 2000-02, conflicts between these two groups erupted periodically. In the eastern part of the Stavropol Territory, in the Levokumsk and Neftekumsk regions, live the Nogais. Compared to conditions in other parts of Russia, the economic position of the Nogais in Stavropol is not bad; however, the question of bringing Nogai representatives into the administrative structures is pressing. The problem of restoring the Nogais’ ethnic unity and their social marginalization are the main factors causing tension between the Nogais and Russians and other ethnic groups. In the 1990’s, the eastern regions of the Stavropol Territory became areas of active migration for Darghins. And these migrants occupied a competitive socio-economic niche that has led to conflicts. In 1999, the village of Irgakla in the Stepnov region saw clashes between Darghins and Nogais. This conflict required the intervention of law enforcement. In 2001-02, Darghins and Turkmens skirmished in the Neftekumsk and Stepnov regions. The principal meaning of the Russian national policy in Stavropol must be a single word: integration. If this integration project is not implemented, the problems that are already part of the segregated regional community in the territory will only increase and any conflict, however mundane, between members of different ethnic groups will be interpreted in time as an interethnic one. Today Stavropol is a frontier, a sort of border dividing the “Russian world” from the “world of the Caucasus,” but the point is that these two worlds represent one state — the Russian Federation. That means that there can be no borders between these two worlds. Russian ethno-national moods and mass xenophobia throughout the country have contributed to the complicated multiethnic situation in Stavropol, which reinforces the point that the national policy in Stavropol cannot be ethnically oriented. Its main priority must be Russian integrism—not only for the authorities, but for all of Russian society.